This isn't our first look, because I don't think silhouettes count, but it is a cool poster. 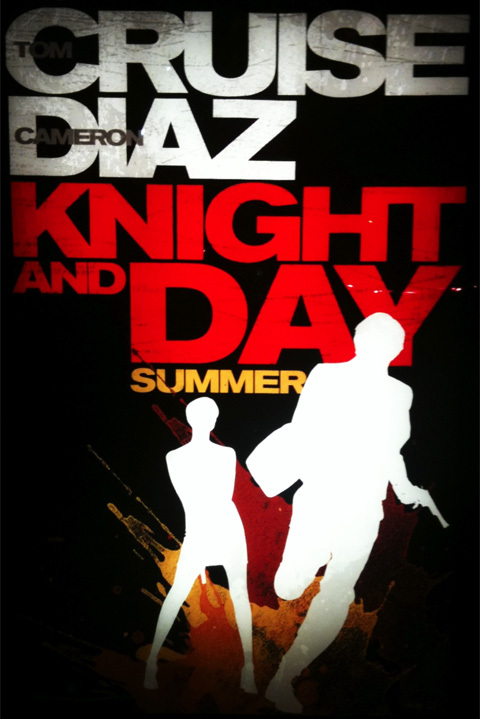 Thanks to SlashFilm we have the first teaser poster for Tom Cruise and Cameron Diaz's summer movie Knight & Day. The action-comedy follows a fugitive couple on a glamorous and sometimes deadly adventure where nothing and no one, not even themselves, are what they seem. "Amid shifting alliances and unexpected betrayals, they race across the globe, with their survival ultimately hinging on the battle of truth vs. trust." Sounds intense. In addition to Cruise and Diaz, this also stars Maggie Grace, Peter Sarsgaard, Paul Dano, and Viola Davis. So far this looks good. I like that they seem to be selling the action in this more than comedy. Bring it on! Knight & Day, formerly known as Wichita or Trouble Man, is directed by New York-born filmmaker James Mangold, of 3:10 to Yuma, Walk the Line, Identity, Kate & Leopold, Girl Interrupted, and also Cop Land previously. The screenplay was written by first-timer Patrick O'Neill whose only other writing credit is on a TV show called "Dead Last". 20th Century Fox is bringing Knight & Day to theaters everywhere starting on July 2nd, 2010 this upcoming summer. We'll let you know when the first trailer hits as well. See you then! Font treatment is cool, bold colors. Cool poster. If this doesn't deliver... well.. Tom Cruise will have to consider other options... being a gardener, a bartender, a janitor... It's almost an obligation for him to have a successful movie next year, otherwise, this will be an addition of the strings of flops in his late career. Could he have another one? Very cool poster: I hope the trailer hits the net asap. nice poster. Saw the trailer before Avatar last night. Wait there's a trailer for this too? Didn't even know that! yeah, just saw the trailer before Avatar "meh"
I saw the trailer before Avatar also and thought it looked decent. entertaining, atleast. I mean, imagine Cruise playing Ethan Hunt that knows he's Ethan Hunt that realy knows he's tom cruise in a movie and he can't die. it's looks pretty good. hey this looks like what was formerly called Wichita, saw some of it being filmed by my work here in boston. i just saw the trailer. it looks awesome. i think the movie will be a success!! !